The 2009 Mustang Cobra Jet – built to celebrate the 40th anniversary of the iconic 1968 Mustang Cobra Jet pioneered by Tasca Ford, and offered to connect with today’s Ford sportsman drag racers even stronger. The FR500CJ is the second purpose-built, turn-key race car engineered, developed, built, and sold through Ford dealers by Ford Racing, and like the FR500S road race car before it, only a limited number of FR500CJ drag cars were built. True to the 1968 Cobra Jet, a total of only 50 copies of the car were made, and all 50 were sold within 10 days. Built with the serious drag racer in mind, along with its striking Cobra Jet graphics, the Cobra Jet features the Supercharged 5.4 Cobra Jet engine, Cobra Jet cold air kit, Cobra Jet throttle body, air conditioning and rear seat delete, crankshaft damper, Cobra Jet bellhousing, 6-speed manual (or 3-speed automatic) transmission with SFI bellhousing, stainless steel long-tube racing headers, 9″ rear axle assembly, one piece driveshaft drive shaft, single hoop drive shaft loop, Cobra Jet rear control arms and anti-roll bar, Ford Racing adjustable dampers, drag race spring kit, and unique Cobra Jet wheels. Inside are a 5″ Cobra Jet IP-mounted pedestal tachometer, a full complement of Ford Racing performance gauges, a short-throw shifter, and Cobra Jet seat package. Completing the package are a safety cage and safety harnesses. Among rare cars, this specific car, serial number FR500CJ XX1, is even rarer. 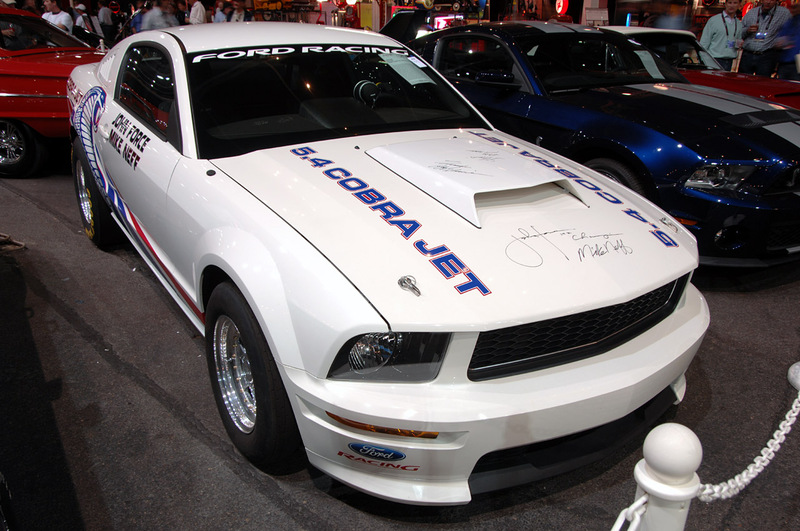 It is the first-ever 2008 Cobra Jet built from the ground up. One of only two prototypes assembled prior to the low-volume production run, XX1 was used extensively in testing and development. Among the accomplished professional drivers who drove this car are funny car drivers John and Ashley Force (both of whom signed its hood), Robert Hight, Mike Neff, and Bob Tasca III. Ford drag racing legends Bob and Bill Glidden also spent time in the car, as did editors from „Car Craft“, „Race Pages“, „5.0“, and „Hot Rod“.